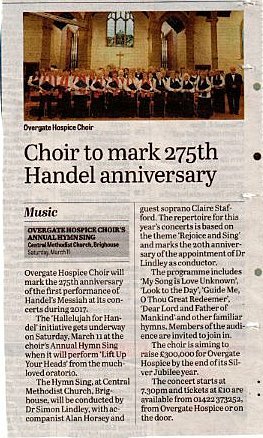 Please give our Joyce Sharp, our Treasurer, your annual subscription which we contribute to cover the costs of our weekly rehearsals. The subscription for 2017 is £80 with a reduction of £4 if you pay Joyce by 29 March 2017. 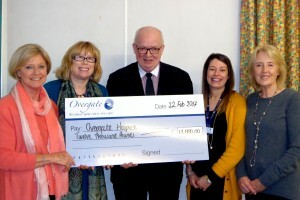 At the AGM on Wednesday 22 February 2017 a cheque for £12,000 was presented to Overgate Hospice Chief Executive Janet Cawtheray, bringing the total raised by the Choir since its formation to £295,626. The AGM will commence at 7.30 on Wednesday 22 February in St Jude’s Parish Hall and will be followed by a rehearsal.